Higashi Chaya Town (ひがし茶屋街) is the largest Tea House Town of Kanazawa. 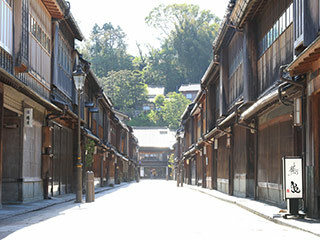 There are many traditional houses, creating fantastic Edo period scenery. You are going to feel like you are walking through ancient Japan. This town is also registered as a Preservation Districts for Groups of Traditional Buildings. Those houses are still in use as tea houses, shops and restaurants. 0. at Kanazawa Station, east side, No.7. 1. use local bus to Hashibacho. Higashi Tea House Town is located east side of Kanazawa castle. There are many traditional buildings that also used as a tea house, gift shops, restaurants and bars. It will be great spot to walking around with Kimono costume. Tea House Constructed in 1820. The original tea house buildings are very rare remaining today. 2nd floor is used for the guest room, so it has higher space comparing to the other houses. Therefore this house is registered as national important cultural assets.